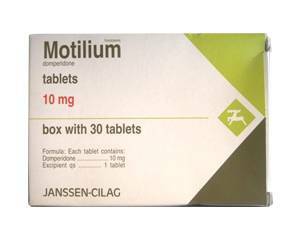 Motilium is a remedy for nausea and vomiting. The active ingredient, domperidone, ensures that the gastric contents are moved in a quick manner to the intestines. In addition, the vomiting center in the brains is less stimulated thanks to Motilium. This quickly reduces nausea and the tendency to vomit. You can order Motilium online through the pharmacies that work with Dokteronline.com. Motilium is prescribed for nausea and vomiting as a result of, for example migraines, gastrointestinal problems, motion sickness or medication. The tablets work quickly and are suitable for adults and children aged over 12 years. Swallow the tablet whole with some liquid. Take Motilium preferably before your meal. This way the drug can act more quickly. If the symptoms do not decrease within a few days, please consult a doctor. Do not use Motilium longer than 7 days without consulting a doctor. Adults and children aged over 12 years (from 35 kg): 1 tablet of 10 mg three times daily. The tablets are not suitable for children aged under 12 years. Do not exceed three tablets per day. Read the instructions before use. If you suffer from side effects (even some not listed in the package leaflet), please contact a doctor or pharmacy. The leaflet provides more information about this topic. have an abnormal level of potassium or magnesium in your blood. If you are taking further medication, these may interact with Motilium. You can read more information about which medicines are involved in the leaflet. A doctor knows which medications may interfere with each other. Use Motilium only on the advice of a doctor if you are pregnant or breastfeeding. Some side effects of Motilium (such as dizziness or fatigue) could possibly affect your reactions. Keep that in mind and do not go on the road if you cannot respond promptly. Alcohol may intensify or provoke side effects such as dizziness or drowsiness. Be careful with the use of liquor when you are taking Motilium.